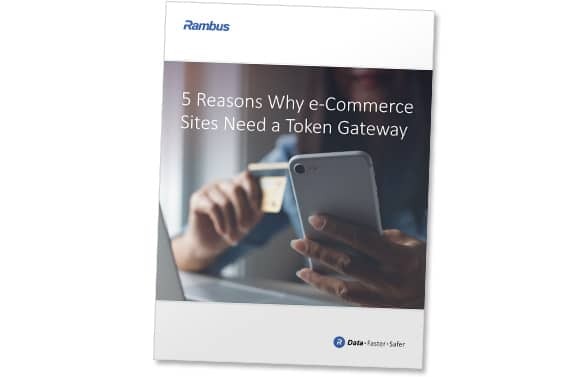 EMV card-on-file payment tokenization is set to both reduce online fraud and deliver a range of benefits to merchants but implementation will not be straightforward, Rambus explains in a new paper that sets out the advantages of using a token gateway to simplify the integration and management process. Card-on-file payment tokenization removes the need for merchants to store actual card numbers by replacing them with tokens that can be restricted to a specific device, merchant, transaction type or domain. This offers the potential to both reduce card-not-present fraud and move further towards a frictionless online purchasing experience. But each payment scheme has its own requirements, specifications and interfaces, ‘5 Reasons Why Ecommerce Sites Need a Token Gateway’ explains, and those specifications are also updated often, requiring merchants to constantly adjust their systems to stay connected to the schemes. A token gateway enables merchants to bypass these integration challenges, however, as it provides a single software interface to multiple global and local payment schemes and is always up-to-date with the latest requirements. The paper describes how a token gateway works and sets out its benefits in terms of reducing complexity, increasing security, lowering costs, shortening time to market and enhancing the consumer experience. Readers can download this 12-page paper free of charge from the NFC World Knowledge Centre.